There’s an unfortunate catch-22 when it comes to organization and stress. Many times a person wants to get organized in order to reduce their stress, but the stress itself keeps them from taking the first step. Meditation, yoga, and breathing exercises can help you deal with momentary stress, but making your space as relaxing and organized as possible will not only make those practices more effective, they’ll make it easier to relax through everything else happening in your life as well. This is going to help more after you’ve taken some of the other steps than at the very beginning, but the idea of a weekly “clean sweep” means that you go through your home with a garbage bag and just… sweep through everything. If you feel like throwing something in the bag, you do it, and from there you decide: toss or donate. Trust your instincts! Having a few conveniently placed hooks here and there are an easy way to make every day organization easier. Plus, as an added bonus, there are plenty of stylish options out there so hanging hooks near your front door or inside your closet can be just as much of a home fashion statement as it can be an organizational tool. Stress and other negative emotions often lead us to make impulsive decisions for a little bit of immediate pleasure, even if it leads to more stress in the long term. This is especially at play when it comes to impulse purchases. Learn to avoid the sale rack, say “no” to impulse purchases, and carefully curate the items kept in your home to keep the unnecessary clutter to a minimum. Scanning and creating multiple digital copies of important paperwork so you don’t have to hold onto any documents that aren’t absolutely necessary is an easy way to keep mess and clutter to a minimum. When you start to think about the best ways to reduce stress via decluttering, don’t burn yourself out by expecting to get everything done the very day you start. Take small steps, create small goals, and shoot for achievable things like “a drawer a day” to better achieve your decluttering goal. If you’re afraid of throwing things out indiscriminately, start small by instead renting a self-serve storage unit that gives you the room to store excess items that you want out of the way but aren’t ready to part with quite yet. 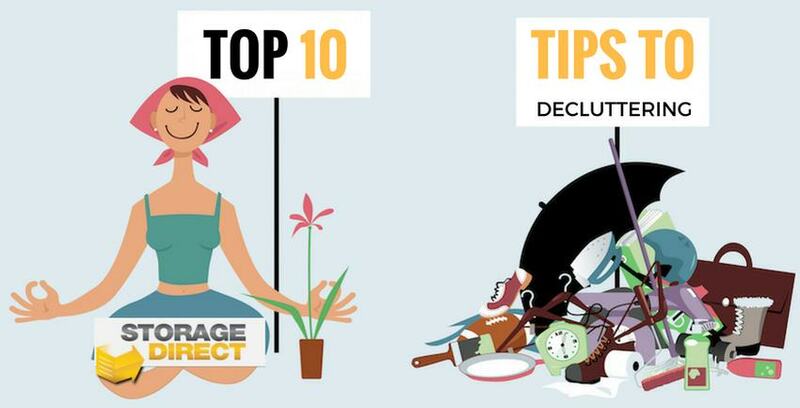 An easy place to start when it comes to decluttering is your closet. There is something almost therapeutic about going through and pulling out things you don’t wear anymore, and it’s an easy way to take that first step. Whether your labels are physical or mental, either way the process of labeling things in a simplified, direct way can help you organize the things in your home. Having specifically labeled boxes for tools, utensils, first-aid items, and other things that commonly get thrown around can lead you toward a more generally organized piece of mind. Use shoe hangers for more than just shoes. Shoe hangers are a great, simple way to add some additional storage to the backs of doors. They can be used in your child’s bedroom for toys, the bathroom for toiletries, or in one of many other, more creative options. Furniture that serves multiple purposes can give you additional storage room without taking up additional floor space that can lead to a home feeling over-full. Look into hollow ottomans that allow for additional storage within, beds with built-in base drawers, or end tables that are also filing cabinets. Whatever you do, don’t get discouraged. Stress is only a momentary experience and taking steps like decluttering will help you not only clear your home but your mind as well.